Back in mid-2014 I was in the midst of Docker-izing the build process at Virtual Instruments. As part of that work I’d open sourced one component of that system, the Docker-in-Docker Jenkins build slave which I’d created. At the time the Docker image repositories on the Docker Hub Registry had to be tied to a GitHub repo (They’ve added Bitbucket support since then). I was too cheap to pay for a private GitHub repo. Unfortunately, making this image publicly available presented some challenges soon thereafter: Folks started linking their blog posts to it, people I’d never met emailed me asking for help in getting set up w/this system, others started filing issues against me on either GH or the Docker Hub Registry, and I started receiving pull-requests (PRs) to my GH repo. Having switched employers just a few months after posting the code to GH, dealing with the issues and PRs was a bit of a challenge: My new employer didn’t have a Dockerized build system (yet), and short of setting up my own personal Jenkins server and Dockerized build slaves, there was no way for me to verify issues/fixes/PRs for this side-project. And so “tehranian/dind-jenkins-slave” stagnated on GH with relatively little participation from me. Having largely forgotten about this project, I was quite surprised a few weeks ago when perusing the GH repo for Disqus. I accidentally discovered that the engineering team at Disqus had forked my repo and had been actively committing changes to their fork! And also modified some environment variable names to avoid collisions with names that popular frameworks would use. Prompted by this, I went back to my own GH repo, looked at the graph of all other forks, and saw that several others had forked my GH repo as well. One such fork had updated my image to work with Docker Swarm and also to be able to easily use SSH keys for authenticating with the build slave instead of using password-based auth. “How cool!”, I thought. I’d put an idea into the public domain a year ago, others had found it, and improved it in ways that I couldn’t have imagined. Further, their improvements were now available for myself and others to use! In hindsight I’m absolutely delighted that my unwillingness to purchase a private GitHub repo led to me contributing the Docker-in-Docker Jenkins slave to the public domain. There was nothing proprietary that Virtual Instruments could have used in its product, and by making it available other organizations like Disqus, CloudBees have been able to benefit, along with software developers on the other side of the planet. How exciting! The Operations Team at Delphix has recently published an Ansible role called delphix.package-caching-proxy. We are using this role internally to host binary packages (ex. RPMs, Python “pip” packages), as well as to locally cache external packages that our infrastructure and build process depends upon. 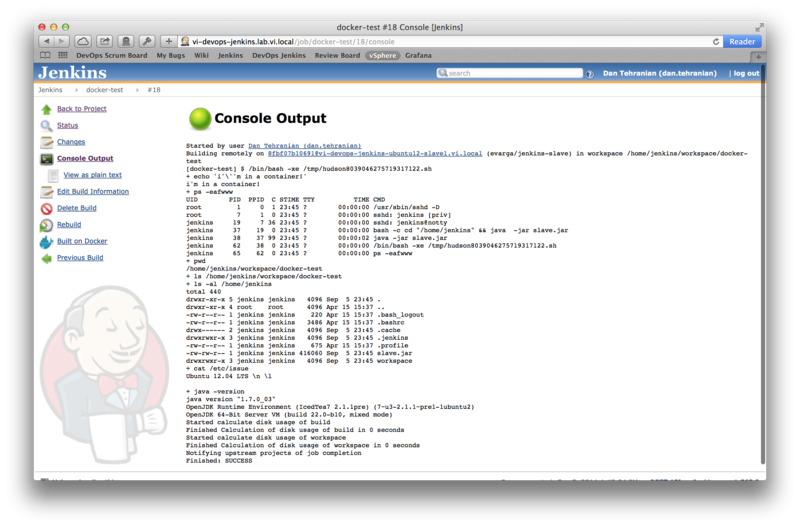 It also provides the hooks for monitoring the front-end Nginx server through collectd. More details here. When your organization has remote offices/employees whose productivity would benefit from having fast, local access to large binaries like ISOs, OVAs, or OS packages. When your dev process depends on external dependencies from services that are susceptible to outages, ex. NPM or PyPI. When your dev process depends on third-party artifacts that are pinned to certain versions and you want a local copy of those pinned dependencies in case those specific versions become unavailable in the future. This role works by deploying a front-end Nginx webserver to do HTTP caching, and also configures several Nginx server blocks (analogous to Apache vhosts) which delegate to Docker containers for the apps that run the Docker Registry, the PyPI server, etc. This role is hosted in Ansible Galaxy at https://galaxy.ansible.com/list#/roles/3008, and the source code is available on GitHub at: https://github.com/delphix/ansible-package-caching-proxy. My former Development Infrastructure Engineering Team at VMware, who proved this idea out by implementing a similar set of caching proxy servers for our global remote offices in order to improve developer productivity. The folks who conceived the Snakes on a Plane Docker Global Hack Day project. In “Improving Developer Productivity with Vagrant” I discussed the productivity benefits gained from using Vagrant in our software development tool chain. Here are some more details about the mechanics of how we created those Vagrant boxes as part of every build of our product. Packer is a tool for creating machine images which was also written by Hashicorp, the authors of Vagrant. It can build machine images for almost any type of environment, including Amazon AWS, Docker, Google Compute Engine, KVM, Vagrant, VMware, Xen, and more. We used Packer’s built-in VMware builder and Vagrant post-processor to create the Vagrant boxes for users to run on their local desktops/laptops via VMware Fusion or Workstation. Note: This required each user to install Vagrant’s for-purchase VMware plugin. In our usage of running Vagrant boxes locally we noted that the VMware virtualization providers delivered far better IO performance and stability than the free Oracle VirtualBox provider. In short, the for-purchase Vagrant-VMware plugin was worth every penny! One of the hurdles I came across in integrating the building of the Vagrant boxes into our existing build system is that Packer’s VMware builder needs to spin up a VM using Workstation or Fusion in order to perform configuration of the Vagrant box. Given that our builds were already running in static VMs, this meant that we needed to be able to run Workstation VMs nested within an ESXi VM with a Linux guest OS! This sort of VM-nesting was somewhat complicated to setup in the days of vSphere 5.0, but in vSphere 5.1+ this has become a lot simpler. 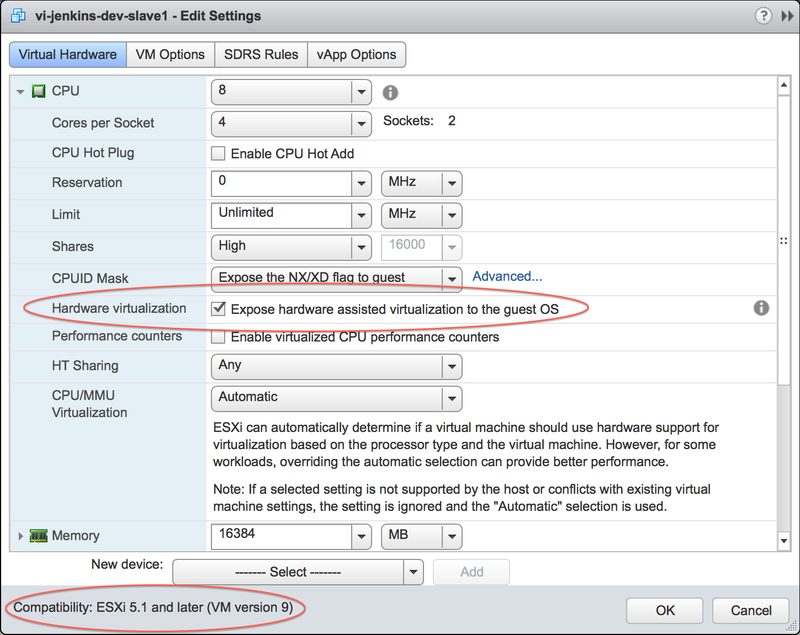 With vSphere 5.1+ one just needs to make sure that their ESXi VMs are running with “Virtual Hardware Version 9” or newer, and one must enable “Hardware assisted virtualization” for the VM within the vSphere web client. The “Remote vSphere Hypervisor Builder” requires manually running an “esxcli” command on your ESXi boxes to enable some sort of “GuestIP hack”. Doing this type of configuration on our production ESXi cluster seemed sketchy to me. The “Remote vSphere Hypervisor Builder” doesn’t work through vSphere, but instead directly ssh’es into your ESXi boxes as a privileged user in order to create the VM. The login credentials for that privileged ESXi/ssh user must be kept in the Packer build script or some other area of our build system. Again, this seems less than ideal to me. As far as I can tell from the docs, the “Remote vSphere Hypervisor Builder” only works with the “vmware-iso” builder and not the “vmware-vmx” builder. This would’ve painted us into a corner as we had plans to switch from the “vmware-iso” builder to the “vmware-vmx” builder once it had become available. As part of improving developer productivity at Virtual Instruments during development of Virtual Widsom 4.0, I introduced Vagrant to the development team. At the time, the product was being re-architected from a monolithic Java app into a service oriented architecture (SOA). Without Vagrant, the challenge for a given Java developer working on any one of the Java services was that there was no integration environment available for that developer to test the respective service that they were working on. In other words, a developer could run their respective Java service locally, but without the other co-requisite services and databases they couldn’t do anything useful with it. Following such instructions would be a very manual, time-consuming, and mistake-prone process. The total time on such efforts would be multiplied by the size of the R&D team as each developer would have to duplicate this effort on their own. Such instructions would be a “living document“, continually changing over time. This means that if Jack followed the instructions on Day X, the instructions that Jane followed on Day X+Y could be potentially different and lead to two very different integration environments. Turning our integration environment into a portable Vagrant box (a virtual machine) solved all of these issues. The Vagrant box was an easily distributable artifact generated by our build process that contained fully configured instances of all of the Java services and databases that comprised our product. Developers could download the Vagrant box and get it running in minutes. The process for running the Vagrant box was so simple that even managers and directors could download a “Vagrantfile” and “vagrant up” to get a recent build running locally on their laptops. Finally, the Vagrant box generated by our build process utilized the identical SLES 11 environment that QA and customers would be running with, so developers would not be running into issues related to differences in environment. I will write a follow-up post about how we use Packer in our build process to create the Vagrant box, but for now I’ll provide some details about our Vagrant box workflow. # at the "192.168.33.1" IP address. Keep in mind that the “Vagrantfile” is executable Ruby code, so there are virtually limitless possibilities for what one can accomplish depending on your needs and desired workflow. The “services.conf” hierarchy allows a developer to direct the service running in their IDE/host OS to connect to the Java services running within the Vagrant box/guest OS (via “~/services.conf”), as needed. It also allows the developer to configure the services within the Vagrant box/guest OS to connect to the Java services running on the host OS via the “/vagrant/services.conf” file. One clarification – The “/vagrant/services.conf” file actually lives on the host OS in the working directory of the “Vagrantfile” that the developer downloads. The file appears as “/vagrant/services.conf” via the default shared folder provided by Vagrant. Having the “/vagrant/services.conf” live on the host OS is especially convenient as it allows for easy editing, and more importantly it provides persistence of the developer’s configuration when tearing down and re-initializing newer versions of our Vagrant box. As part of our workflow I found it to be easiest to have users not download the Vagrant .box file directly, but instead to download the small (~3KB) “Vagrantfile” which in turn contains the URL for the .box file. When the user runs “vagrant up” from the cwd of this “Vagrantfile”, Vagrant will automatically detect that the Vagrant box of the respective name is not in the local library and start to download the Vagrant box from the URL listed in the “Vagrantfile”. More details available in the Vagrant docs: http://docs.vagrantup.com/v2/vagrantfile/machine_settings.html Note: Earlier this year the authors of Vagrant released a SaaS service for box distribution called Vagrant Cloud. You may want to look into using this, along with the newer functionality of Vagrant box versioning. We are not using the Vagrant Cloud SaaS service yet as our solution pre-dates the availability of this service and there hasn’t been sufficient motivation to change our workflow. 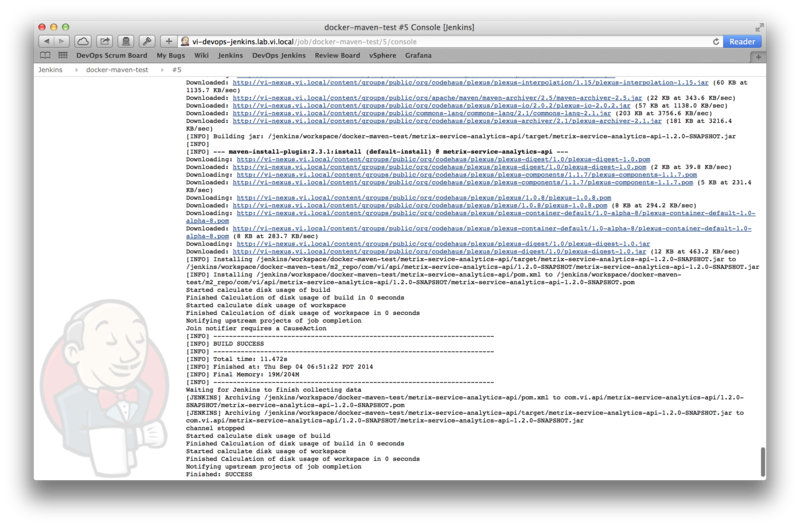 Using Jenkins‘ Docker Plugin, we can dynamically spin-up SLES 11 build slaves on-demand to run our builds. One of the hurdles to getting there was to create a SLES 11 Docker base-image, since there are no SLES 11 container images available at the Docker Hub Registry. We used SUSE’s Kiwi imaging tool to create a base SLES 11 Docker image for ourselves, and then layered our build environment and Jenkins build slave support on top of it. After configuring Jenkins’ Docker plugin to use our home-grown SLES image, we were off and running with our containerized SLES builds! The path to Docker-izing our build slaves started with stumbling across this Docker Plugin for Jenkins: https://wiki.jenkins-ci.org/display/JENKINS/Docker+Plugin. This plugin allows one to use Docker to dynamically provision a build slave, run a single build, and then tear-down that slave, optionally saving it. This is very similar in workflow to the build VM provisioning system that I created while working in VMware’s Release Engineering team, but much lighter weight. Compared to VMs, Docker containers can be spun up in milliseconds instead of a in few minutes and Docker containers are much lighter on hardware resources. Your base OS needs to have Docker listening on a TCP port. By default, Docker only listens on a Unix socket. The container needs run “sshd” for Jenkins to connect to it. I suspect that once the container is provisioned, Jenkins just treats it as a plain-old SSH slave. # plugin (the port for sshd fails to map to an external port). Having built up the confidence that we can spin up other people’s containers on-demand, we now turned to creating our SLES 11 Docker build image. For reasons that I can only assume are licensing issues, SLES 11 does not have a base image up on the Docker Hub Registry in the same vein as the images that Ubuntu, Fedora, CentOS, and others have available. At Virtual Instruments we were already using Kiwi to build the OVAs of our build VMs, so we were already familiar with using Kiwi. Since we’d already been using Kiwi to create the OVA of our build environment it wasn’t much more work to follow that blog post and get Kiwi to generate a tarball that could be consumed by “docker import”. This worked well for the next proof-of-concept phase, but ultimately we decided to go down another path. Rather than have Kiwi generate fully configured build images for us, we decided it’d be best to follow the conventions of the “Docker Way” and have Kiwi generate a SLES 11 base image which we could then use with a “FROM” statement in a “Dockerfile” and install the build environment via the Dockerfile. One of the advantages of this is that we only have to use Kiwi to generate the base image the first time. After there we can stay in Docker-land to build the subsequent images. Additionally, having a shared base image among all of our build image tags should allow for space savings as Docker optimizes the layering of filesystems over a common base image. 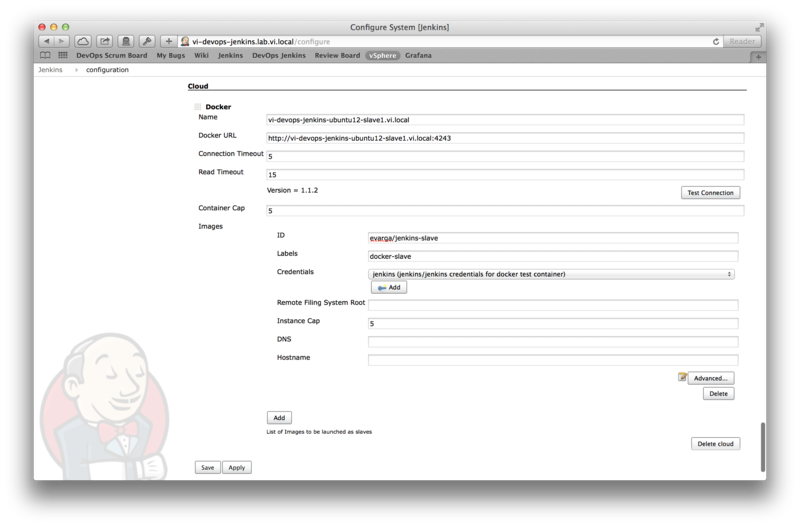 # configuration to be used as a Jenkins slave build node. # Fix sshd's configuration for use within the container. See VW-10576 for details. Hooray! 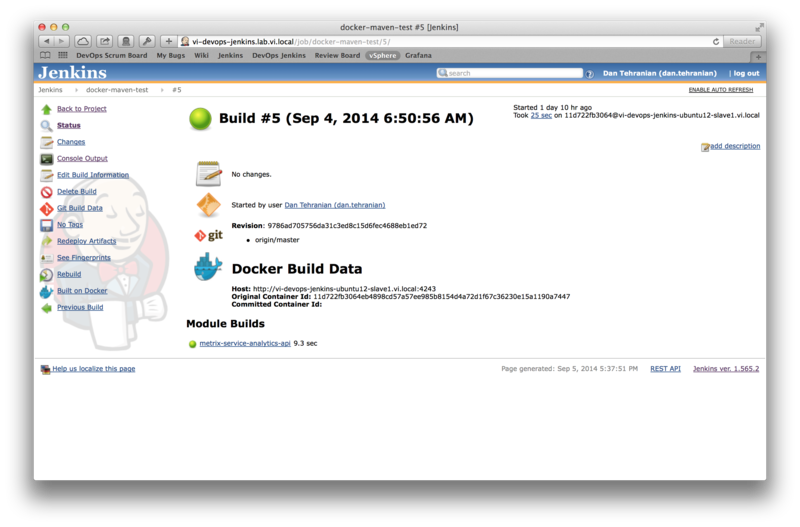 A successful Maven build inside of a Docker container! Output from the Maven Build that was run in the container. LGTM! We don’t have to run & support SLES 11 VMs in our infrastructure alongside the easier-to-manage Ubuntu VMs. We can just run Ubuntu 12.04 VMs as the base OS and spin up SLES slaves as needed. This makes testing of our Puppet repository a lot easier as this gives us a homogeneous OS environment! We can have portable and separate build environment images for each of our branches. Ex: legacy product branches can continue to have old versions of the JDK and third party libraries that are updated only when needed, but our mainline development can have a build image with tools that are updated independently. This is significantly better than the “toolchain repository” solution that we had at VMware, where several 100s of GBs of binaries were checked into a monolithic Perforce repo. Thanks to Docker image tags, we can tag the build image at each GA release and keep that build environment saved. This makes reproducing builds significantly easier! Having a Docker image of the build environment allows our developers to do local builds via their IDEs, if they so choose. Using Vagrant’s Docker provider, developers can spin up a Docker container of the build environment for their respective branch on their local machines, regardless of their host OS – Windows, Mac, or Linux. This allows developers to build RPMs with the same libraries and tools that the build system would! Alan Grosskurth from packagelab.com presented on the Heroku buildpack API & his improvements to it. He also touched on LXC containers and how he’s using them. Finally, my own presentation went quite well. There were a lot of people in the audience that came up to chat with me afterwards and it seemed that the message really resonated with the audience (confirmation bias, much? : ). From the sounds of it, I may have an opportunity to give an extended-version of this talk at Google and VMware in the near future which is great because there were several ROI examples and software industry anecdotes around quality and time-to-market that I had to cut out to meet the time requirements. At Virtual Instruments we have some ~50 Jenkins jobs that generate the RPMs from each of our GIT repos as well as the appliance images of our product (ISO, OVA, PXE, Vagrant, etc). Over the past few months my team had put a lot of time & effort into taking the configuration of all of those pre-existing, manually created jobs and codifying them via the Jenkins Job DSL Plugin. This week all of that hidden “plumbing” work finally paid its first dividends for us when we had to cut the branch for our upcoming release, and the benefit was enormous. Since the Job DSL Plugin puts all of our configuration into source control and gives us the ability to programmatically create all of our Jenkins jobs, it saved us many painful hours of manual job configuration via the Jenkins UI. Instead of having to copy each of those existing 50 jobs and modify them by hand, we only had to do some editing of our Groovy files, send for review, submit the changes to our Git repo, and watch the new jobs get created automatically. Given that this was our first time doing this type of release branching we had to work out a few kinks and do extra validation, but by 5pm we had all of the continuous builds working for each repo as well as images for our product being successfully created. Even better is that as we were working out a few obscure kinks with the developers, those developers quickly realized that they too could edit the Groovy files in Git to make simple changes to the job configuration. In other words, the developers realized that they were not gated upon our DevOps team to make job configuration changes for them. I’m hoping that we can expand on this in the coming weeks and have the developers take even more ownership of the build job configurations. The big benefit with the Job DSL Plugin is that it takes job configuration that was previously done by hand in a UI and puts it into a documented format in source control where the changes can be reviewed via Review Board and tracked over time. With that we can confidently provide access to making job configuration changes to the whole development team which ultimately makes for a quicker configuration change process and a lighter workload for my team.